I’m so happy to see this! I don’t deviate a whole ton in my nutrition – I can’t say I get bored, thankfully, but having a variety of spices really helps me avoid that trap to begin with. I typically use whatever savory seasoning I feel like in the morning, and generally prefer that to sweet. That said, it is always nice to have more…and new…options! 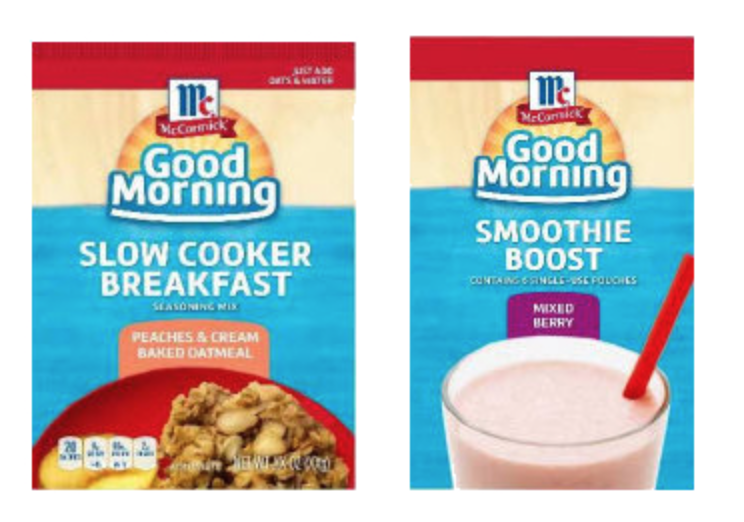 Enter McCormick’s “Good Morning” breakfast enhancers! These newbies focus specifically on breakfast and are designed to add a flavor boost to your yogurt, oatmeal, smoothies, slow-cooker breakfasts…or whatever else you might desire. I personally LOVE spice blends and dry seasonings because they tend to be a lot less caloric, giving me the opportunity to eat more of the protein, for example, instead of bulking up on empty condiment calories and less food. Even more exciting…there are purportedly 18 items in the lineup, scheduled to hit stores later this year. BOOM!